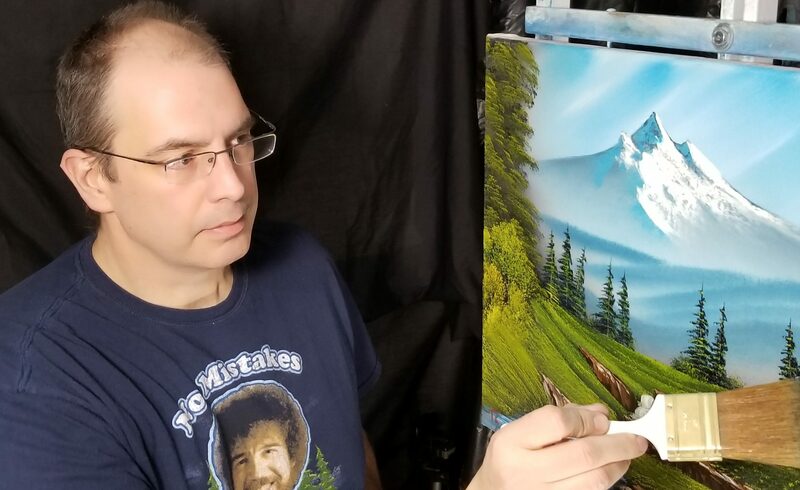 Anyone can paint like Bob Ross, even if you never picked up a brush! Having a great new year so far, how about you? January is the start here of some new features for my website. More frequent posts, updates, videos than i have done in the past, and hopefully these regular updates will help to keep you coming back for more. As always, get ahold of me if you have any questions, booking opportunities, thoughts, feelings anything at all! So January is the time where i am holding classes that have been booked for some time now. Since people have realized that giving Classes out as gifts is a great way to share the Joy of Painting with their friends and family, I have been quite busy with events for the new year already! Not only for January, but February and March are heating up to! Please let me know if you want to have your own event, or join an existing event, but be warned, they have been filling up quick! I have also booked a few appearances as a CRI that have been requested through Bob Ross Inc. I am so happy, proud and excited to be headed to Chicago next month at a vendor show for the Indiana High School Art Exhibition, just recently was asked to take part in a charity event for Gamer’s Outreach in March. More details as they arrive. Im still doing my weekly stream, 35+ consecutive Wednesdays and counting! Catch up on all the craziness at www.twitch.tv/paintwithted.